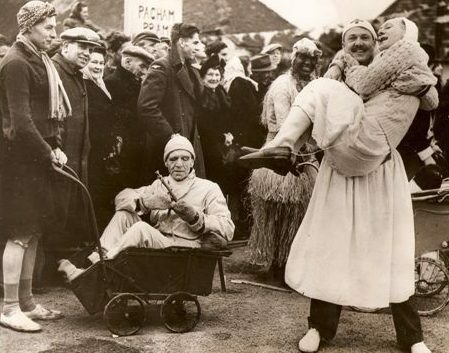 The Pagham Pram Race has a 60+ year history. In 1946 a group of demobbed servicemen decided they would race. One pushing the pram and another as a baby in it, making sure to drink a pint each, at all the villiage pubs. The prize, a christmas fruit cake. Since then the Pagham Pram Race has been run every year on Boxing Day, whatever the weather, starting at the mill on Pagham Road and passing The Bear, The Lamb The Kings Beach, a course of approximately 3 miles that finishes at The Lamb car park. Lately there has been as many as 60 Pram Entrants, some of these are fantastic designed floats usually accompanied by topical fancy dress costumes. 2006 saw entrants as far a field as Australia and USA. During these years many thousands of pounds have been raised for local causes both from the entry money, and of course, donations from the thousands of public that lined the route. The President of the event is none other than the former Le Mans winner and Pagham farmer, Derek Bell MBE. Derek has been involved with the race since he was 17. With your help, we can achieve more!